Miniature. Tempera and gold on vellum. Leaf: 193 x 145 mm. 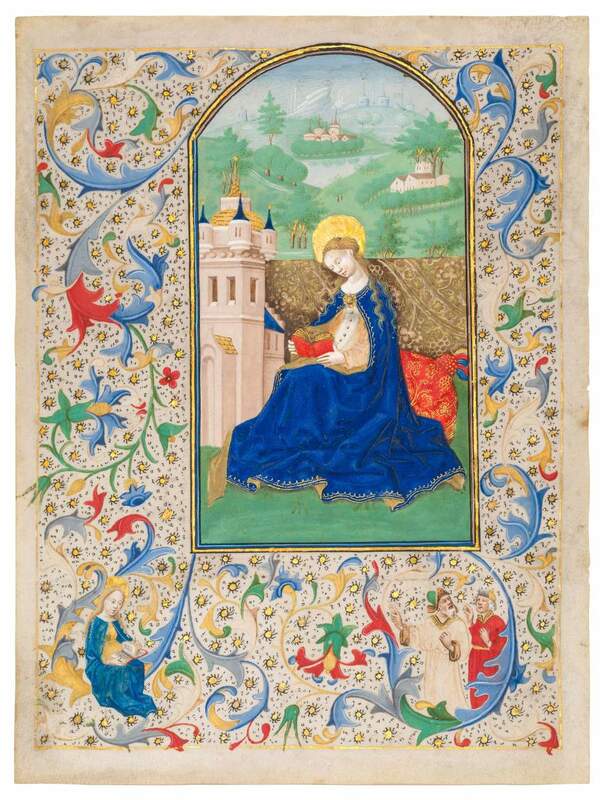 The fine young virgin saint with her soft, delicately drawn face and dressed in a rich, blue mantle falling down in lush folds, is absorbed in her prayer book. In this masterful composition by the Dunois Master and his workshop, Saint Barbara sits on a large, red brocade cushion in a wide landscape, reading a red book. Her attribute, the tower in which she was held captive, stands to her right. A magnificent golden brocade cloth of honour separates the protagonist from the wide scenery, with several hills with houses and town architecture, a lake or river, and in the far distance snowy mountains. The saintly Virgin wears a lush, dark blue cloak, her hair falling in wavy locks over her shoulders. She seems to be completely absorbed by her reading. The surrounding border is handsomely decorated with fleshy acanthus leaves in changing tones, in which in the lower zone another reading Virgin is seated. Opposite her, two men seem to discuss her fate – this is most likely a scene from Saint Barbara’s life and martyrdom. This miniature leaf comes from a deluxe Book of Hours and originally would have opened either the Suffrages or the Office of Saint Barbara.